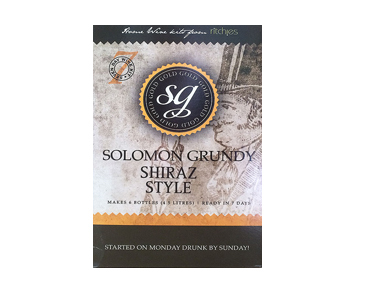 Order Solomon Grundy Shiraz Red Wine Kit 30 bottle from the Stirling Homebrew Shop UK. Buy Solomon Grundy Shiraz Wine Kit - 30 bottle and other Wine Kits safely online in the UK. This wine kit makes 30 bottles of homemade wine in just 7 days! Solomon Grundy wine kits are ready to drink in approximately 7 days! Our UK Homebrew Shop sells real Solomon Grundy and other Wine Kits safely online to customers throughout the United Kingdom in England, Wales, Scotland and Northern-Ireland. View more products on the Stirling Homebrew Shop from Solomon Grundy. Where to buy Solomon Grundy Shiraz Red Wine Kit 30 bottle safely online? Shop at the Stirling Homebrew Shop if you are wondering where you can buy Solomon Grundy Shiraz Wine Kit - 30 bottle safely online in the United Kingdom. Our Homebrew Shop is located in the UK and our independent store has been serving customers in England, Wales, Scotland and Northern-Ireland since 1976. You can buy our Wine Kits online and we post out orders to any UK address. Shiraz Red Wine Kit 30 bottle - Solomon Grundy Shiraz Wine Kit - 30 bottle in Wine Kits and Homebrew.